Achievements: Chairman of Wipro Technologies; Richest Indian for the past several years; Honored with Padma Bhushan in 2005. 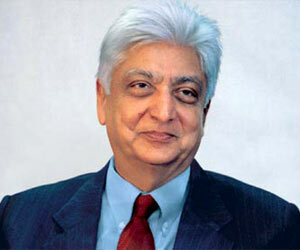 Azim Premji is Chairman of Wipro Technologies, one of the largest software companies in India. He is an icon among Indian businessmen and his success story is a source of inspiration to a number of budding entrepreneurs. Born on July 24, 1945, Azim Hashim Premji was studying Electrical Engineering from Stanford University, USA when due to the sudden demise of his father, he was called upon to handle the family business. Azim Premji took over the reins of family business in 1966 at the age of 21. At the first annual general meeting of the company attended by Azeem Premji, a shareholder doubted Premji's ability to handle business at such a young age and publicly advised him to sell his shareholding and give it to a more mature management. This spurred Azim Premji and made him all the more determined to make Wipro a success story. And the rest is history. When Azim Premji occupied the hot seat, Wipro dealt in hydrogenated cooking fats and later diversified to bakery fats, ethnic ingredient based toiletries, hair care soaps, baby toiletries, lighting products and hydraulic cylinders. Thereafter Premji made a focused shift from soaps to software. Under Azim Premji's leadership Wipro has metamorphosed from a Rs.70 million company in hydrogenated cooking fats to a pioneer in providing integrated business, technology and process solutions on a global delivery platform. Today, Wipro Technologies is the largest independent R&D service provider in the world. Azim Premji has several achievements to his credit. In 2000, Asiaweek magazine, voted Premji among the 20 most powerful men in the world. Azim Premji was among the 50 richest people in the world from 2001 to 2003 listed by Forbes. In April 2004, Times Magazine, rated him among the 100 most influential people in the world by Time magazine. He is also the richest Indian for the past several years. In 2005,Government of India honored Azim Premji with Padma Bhushan.